Show U Right A Night w/tha Djs makes its return to the world famous Carbon!!!! Come on out and sweat w/us on the dancefloor!!!! Sound the Alarm!!!! Brand new video by Philosophy ft the beautiful vocals of Jessica Johnson. Recorded & mixed by S.O.U.L.-O. at Long Beach Most Wanted Studio. Shay Fresh hitting us with a amazing cinematic concept masterpiece of Rashondra Angelle "With Love" produced by yours truly S.O.U.L.-O. You can either get down or lay down fool!!!! Lil mix I dropped live at the legendary Fais Do-do. Glad I decided to hit record on this glass of smoothness. Please, turn the volume up & take a sip. I often like to challenge myself. But more times than not appreciate the challenge presented to me by others. The homie Dj Stone hit me up to drop a Drum & Bass/Jungle mix for his radio show. But I honestly haven't been up in the scene as much as I probably should & really didn't have any current trending tunes. Just the classics & a lot of my own personal selections that I've incorporated in previous mixes over the years. That's when the light bulb went off. Why don't I rework & produce my own Drum & Bass/Jungle tunes for this mix. So I started with a break, seasoned it with a sample, added elements of turntablizm & various other production technics. Two weeks later I felt the canvas's had enough paint & now I'm ready to share my master piece with the world. I titled the album "Broken Needlez #22 Outerlimits Mix" to reflect my continued growth in sound of one of my favorite mix series & as an ode to my very first attempt at making Drum & Bass; "Outerlimits". Which is featured on "Migraines Uv Melodies #1" released on Cd close to fifteen years ago. Sheesh how time flies . . . This album is dedicated to those who's ears are tuned & who's minds are in tune to something just a little different. I welcome you to take this journey with me to the outerlimits. S.O.U.L.-O. I'm pleased to announce that all the hard work has paid off & now its time to present our efforts to the public. In 2015, the House of Blues Music Forward Foundation awarded a $25,000 Action for the Arts Impact Grant to the Social Justice Learning Institute (SJLI). This award supported the addition of a music studio at our Inglewood community center. The new studio gives youth and an opportunity to become familiar with the recording studio environment and the art of music recording. 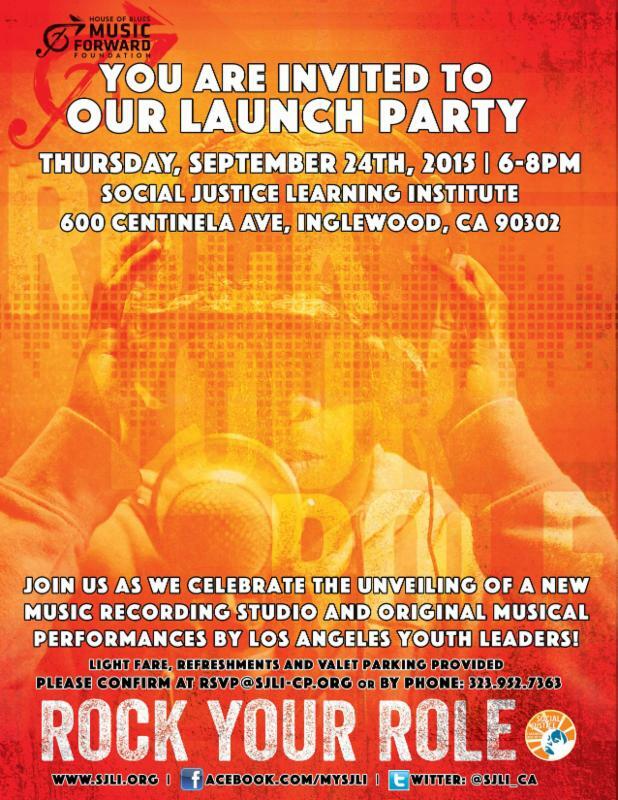 Join us as we celebrate the unveiling of the studio, enjoy original music performances by Los Angeles youth leaders and come together around a strategic partnership that celebrates story through music and fosters unity through shared experiences. We are excited to invite you to attend this invite only event. Please click the link below to register. Brought to you in partnership with the House Blues Music Forward Foundation. Your tax-deductible contribution, or monthly recurring donation will support SJLI's continued work in Educational and Health Equity. Click here to contribute to SJLI. The Birthday Turn-Up week marathon had me rockin 8 different events in 7 days. After a year off the Sauce. I thought it only right I come back in style & reclaim my title as Her favorite Dj. By Her I mean your girl. Yes Im her favorite Dj, just deal with it. So Fellas cuff her tight or do yourself one better & throw this mix on to set the mood. One of my instrumentals made the cut for the "BEST OF ZYPHER: Volume II" check it out!!! Rashondra Angelle hittin yaw wit a lil bit of Janet Jackson "I Get So Lonely" Remix Produced by S.O.U.L.-O. Back for the first time, Long Beach's own S.O.U.L.-O., also known as DJ SOUL-O, drops a gem with Zypher entitled "The Awakening"
Made a cool lil cameo in this flick dedicated to the vinyl record. Check the preview. LongPlaying the Third from Spin Bridge on Vimeo. Was able to make a small contribution to this amazing compilation. Tron7seize, Arievolution - Celebramos La Vida. Recorded & mixed by S.O.U.L.-O. @ Long Beach Most Wanted Studio. Did this mix when Banana's was poppin. Well to be completely honest I didnt intend on dropping this mix. I was setting up my equipment & there was already two handfulls of females posted up. They must have been thinkin the same thing, cuz they started attackin me like zombies chanting ratchet, ratchet, ratchet at the top of their lungs. No lie. Well maybe a little embelishment but not much. Either which way this my lil "TurnUp Mix"all the way live!!! This mix is for promotional, listening enjoyment only & any duplication & resale will be met wit a pimp slap. This is the mix I dropped last night @ "The Love Lock" Nishati Vibrationsï»¿. I thank Food, Socks & everybody in attendance that added their collective good energy. Till WE do it again Bump LOUD & Enjoy!!! Featuring the Incredible "Hillard Streets"
Calling all artist, poets, musicians and vocalist to come offer expressions of love through your work. We will be affirming, confirming and being in divine alignment with our higher selves through love and the arts. Join us in celebration of love, while sharing in ways to continue Ujamaa for the New Year. Ujamaa is the fourth principle of Kwanzaa, and means "to build our own businesses, control the economics of our own community and share in all its work and wealth." "The Love Lock" is an event that weaves an innate ability to be love, with an awareness to exude all that you are through your work. We aimed to ascend past all grudges, faults, blames, heartbreaks and pains, be it family, friends or relationships, that block us from our light. Sierra Hill hit me up for a few beats & put together a banger!!!! Listen/Download!!!! Had the pleasure of djing the Black Cotton Photographic Art Book release. Which celebrates the beauty of African American Women & influence of style & culture. Peep the behind the scene footage. Hit the link & grab the book!!! Its a must have collectors item. Block Star Hip-Hop Mix #15 (Live @ Kaos Network) Got a invite to Rock "TakeFlite Artist Showcase" at the Legendary Kaos Network in Leimert Park. Felt the collective good vibes of just being there. Along w/ the Amsterdam that kept being passed my way. So I figured I record my Dj set. Lil Wayne; Kendrick Lamar; Jay-Z; Gucci Mane; Flying Lotus; Kanye West; Wiz Khalifa; TOKIMONSTA; Pusha-T; Meek Millz; Rick Ross; Scarface; Nas; Casual; Big Sean; Big K.R.I.T. & S.O.U.L.-O. And the beat goes on!!!! Was all over the place like I often am. But I guarantee!!!!! Those things on the side of your head called ears, are going to enjoy this mix. What are you waiting for?!?! Hit play & bump loud!!!! Had a really cool time being as they called it "Dj facilitator" at the Iman Omari Vibration album release party. They even had a special guest in the house which I felt inclined to show off for in my closing Dj set. Thanx to Ill Society for the invite & errbody else for showing luv.